Ah Anduin, it's been a while. 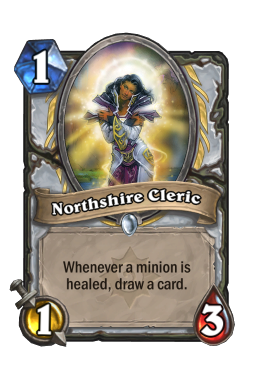 We've covered just about every class since the Witchwood first dropped, but Priest has been notably absent. The reason? It hasn't had any cool decks. Well, that is until now. Mind Blast Control Dragon Priest has steadily gained steam over the past weeks, and now it's gotten legend enough that I wanted to break it down. This list is awesome because it is a control deck that solves one of controls biggest issues: being able to do damage. Adding in Mind Blast gives the deck a ton of reach and enables it to play in various ways depending on what you're up against. That versatility, combined with the fact that it is excellent against two of the best classes in the game, makes it one of the best choices for climbing the current ladder. The Win Condition Do not be fooled. This is not a Dragon Priest deck. 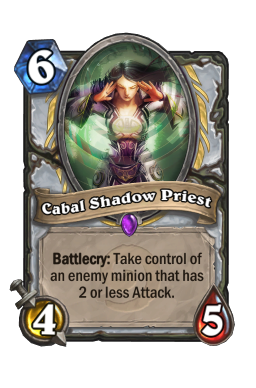 I know you think it is, but as with a certain Control Priest build we covered so long ago, you do not want to let yourself get fooled. This build is a combo deck, but it is vastly unlike any other combo deck we've ever covered. Though there are several ways to win here, the main way is to become Shadowreaper Anduin , play Alexstrasza , and then combine the Death Knight hero power with three Mind Blast s (two regular and one off of Shadow Visions ) to kill your opponent out of nowhere. In that way, this build is a lot like Freeze Mage. Your opponent needs to answer your board and deal with threats, but that only makes them more susceptible to your finishing combo. 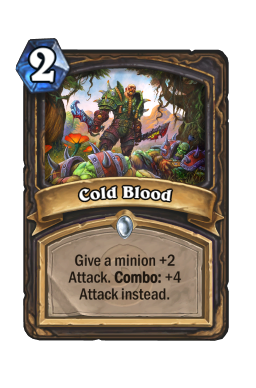 Normally, combo lists are only built around one combo and all the other cards support it. Though that can be true here, this deck is unique because it works in a way where you can also play slow control or midrange depending on what you need. You don't have to win with all the pieces. In fact, you don't need any of them to take home a victory. Sometimes you fully blast your opponent to death, but sometimes you use one or two of the spells as burst damage to follow up a strong board. Some games you simply go full midrange and chip your opponent down through a combination of dragons, removal, and Cabal Shadow Priest . Just never lose sight of your goal. Regardless of what you're going up against, you always have burst at your disposal. Play to it when you can and never shy away from leaning on that damage. Silence/Divine Hymn Your two tech cards, Silence and Divine Hymn , both serve wildly different but important purposes. 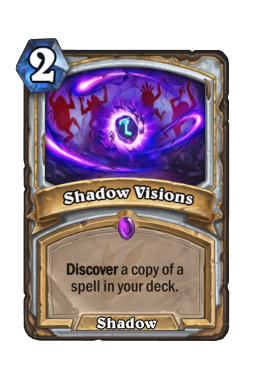 As has been the case for some time, Shadow Visions enables Priest to run more one-of's than other classes. That is because, should you need the spells, you can always double dip to get more than one copy. Slow Control Priest decks need a toolbox of cards to reach their full potential, and these two are extremely strong at shoring up some of the biggest issues in the meta. Silence , as we covered last week on The New Standard, is incredibly powerful right now. The meta is full of Warlocks, and that doesn't account for the numerous buffs or powerful deathrattle minions running around. 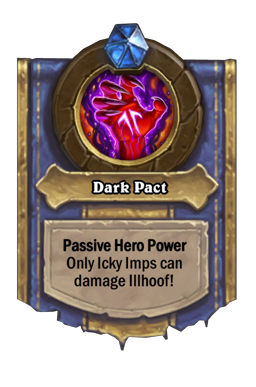 Though this is not a card you're going to use every game, having access to it is incredibly important at stopping certain early game decks or making sure you can't get combo killed as you look for your stronger spells. 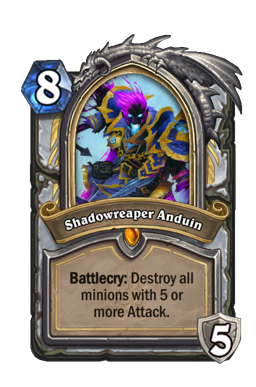 It also gets you more Shadowreaper Anduin triggers as well. 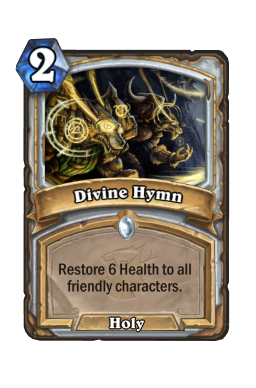 On the other hand, Divine Hymn is just more healing. While your hero power is good at getting you some extra health here and there, you rarely have time to get much value out of it. Rather, you need to have an option that can help you instantly climb up above a certain level. The six health from hymn (usually stacked on top of your hero power) gives you a good amount of healing when you need to fight burst decks. There are many games where you simply can't generate enough ways to keep your opponent's minions off your face. Then, by the time you manage to stabilize, you die to burn. The two mana spell greatly helps with that. It also does a great job of healing your dragons after trading, and gives you more ways to go off with either Wild Pyromancer or Northshire Cleric . Shadow Visions Shadow Visions is a key part of this build, but that does not mean you always need to use it to pull Mind Blast . Yes, getting a third blast is incredibly important in some games, but it is always important to understand your win condition going into a match. If you are up against aggro or midrange you just want to find clear or AOE spells as much as possible. Even if you cannot get use out of a certain spell right away, it is often right to go ahead and pick something you will need down the line. It is so easy to overlook certain cards by analyzing your situation at hand, but planning for the future is important. 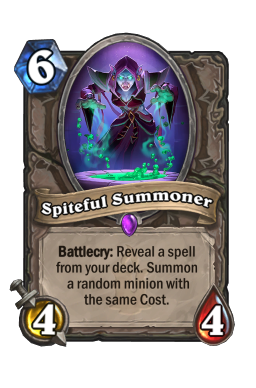 For example, it is often a good idea to get a Shadow Word: Death to preemptively plan for Spiteful Summoner against Druid even when you're only facing small minions. Never get caught up in the moment. On the other hand, when you're up against slower decks you want to go all-in on Mind Blast . Always remember that, in order to play your full combo, you need three of the two mana spells. That does not mean you need to spend both of your Shadow Visions on Mind Blast, but you definitely want at least one extra. 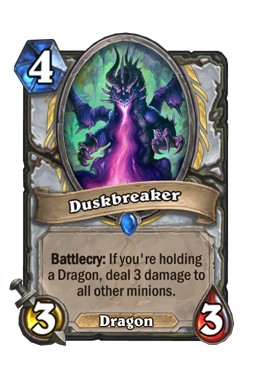 That will ensure you can finish things after Alexstrasza , or that you can slowly chip your opponent down into range with Shadowreaper Anduin . Very few people will play around your burst potential, and that is especially true of slower builds. Try to get Mind Blast from your visions as soon as possible when playing against Warlock, Control Mage or the like. 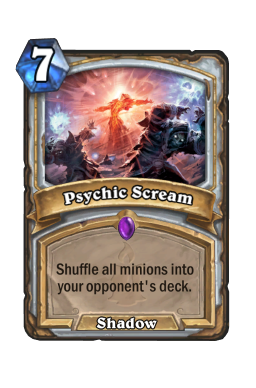 Psychic Scream In my opinion, there is no card in this deck more powerful than Psychic Scream . The seven mana spell is perhaps the most no-nonsense AOE ever printed. While it has seen a bit of play in the past, it is incredibly powerful now because there is no real way for top decks to play around it. They either hold back their cards and give you time to dig for your combo, or they run out their bigger threats and have them shuffled away. That is yet another reason having burst is so important. Unlike other clears, scream does not discriminate. Deathrattle minions, sticky threats, powerful bodies, it does not matter. They all go away. It is very rare that you get something that works that well, which means you should always pull the trigger on this last. It can be tempting to slam this as soon as your opponent builds up a board, but you always want to exhaust all your other options first. Another important note about this card is that you should never shy away from using it when you need to set up your combo. It can be quite easy to worry about shuffling away your own minions, but a clear board is a clear board. 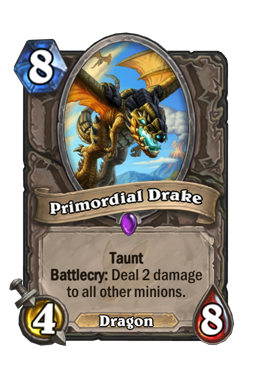 Primordial Drake The more I play this deck, the more I realize how strong Primordial Drake is. That is because the 4/8 is incredibly strong against all popular decks in the current meta. Against aggro, it is a wonderful top-end minion that (as noted in the videos) can end games on its own. 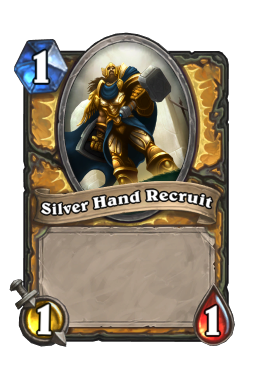 If you play this in the right situation against something like Paladin they are never going to be able to come back. 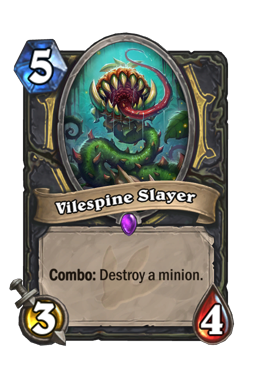 Even if they can rebuild the board (and most decks can) it often won't matter simply because of how much time this card will buy you. You have a lot of AOE, but there are going to be games where you can't draw it. 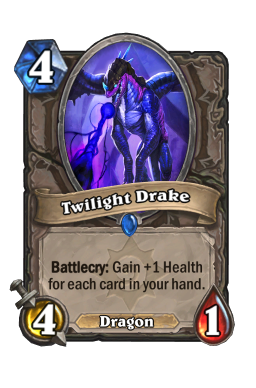 The extra two or three turns Drake can get you against faster decks are often the different between winning and losing. In such matches, this should almost always be your turn eight play. 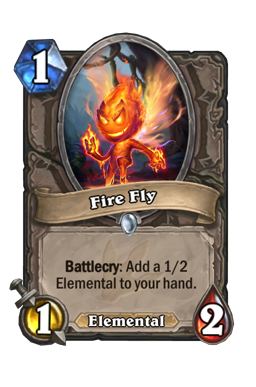 The other reason this card is so strong is because how much work it does towards playing to your win condition. 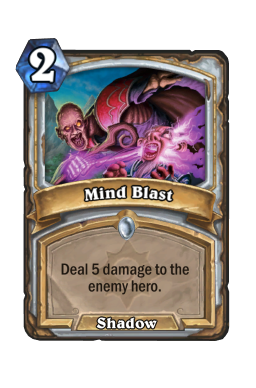 You are a combo deck that is most often going to win the game with Mind Blast s. However, that does not mean you can only set your burst up in one way. Healing exists, and there are several lists out there that you have to break down before they fall into blast range. Drake is a fantastic way to do that because the big body absolutely wears down control. 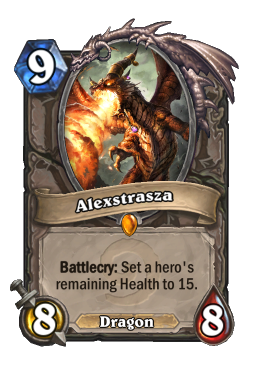 Always try to run this out before Alexstrasza to put out extra pressure and lean on the giant taunt if you ever need to steadily chip away at either armor or healing potential. This is easily one of the strongest minions in this build and you need to treat it as one of your finishers more than just another minion. The four decks I see the most while playing the ladder. Control Warlock Some things just never change. Warlock is still the most popular class in the game, with both Cubelock and Control contributing to a big part of the ladder. That's the bad news. The good news? If you hate Warlock, this is the deck for you. 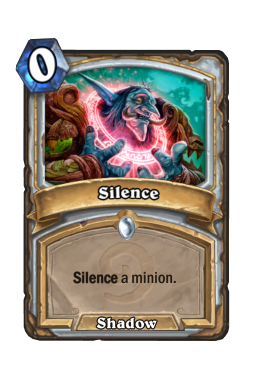 Not only do Silence and Psychic Scream both give you more than a few ways to deal with annoying combo cards, but there is very little Warlock can do about your ending combo. This one is almost always going to play out in the same way. 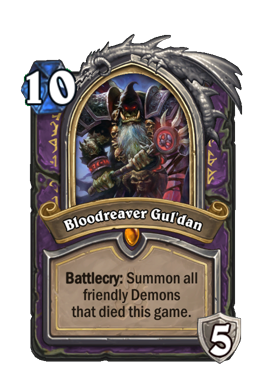 You spend your early turns doing your best to draw cards, your opponent plays some combo pieces that you answer with removal or AOE, and then you kill them once you draw all of your Shadow Visions and Mind Blast s. This is a slow game, and the only way you can lose is if Gul'dan combos off too early. Always play around potential burst damage and never be afraid to pull the trigger on Psychic Scream once you see two demons. The clear may not completely cripple your opponent's combo, but it will slow Bloodreaver Gul'dan down long enough for you to draw through your deck. As you saw in the video, you want to be patient in this one. Warlock is a deck that can get hit by Alexstrasza , but only at the right time. 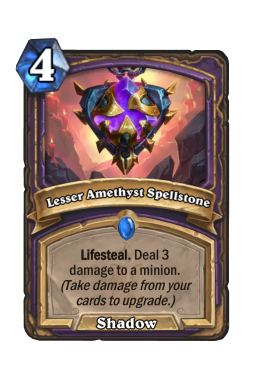 They have quite a bit of healing, and if you pull the trigger too early they will simply run out Lesser Amethyst Spellstone or Dark Pact to instantly negate the dragon's burst. Rather, steadily chip away at your opponent through the board or Shadowreaper Anduin 's hero power. The Death Knight is one of the best ways to pressure your opponent without using too many resources. It is also one of the best ways to test for any potential healing. If you transform and your opponent uses their last healing to get out of range, the coast is then clear for Alex. Stretch your opponent thin and do your best to steadily bleed them of cards. You will take this one once they're out of options. Spiteful Druid Sliding in right behind Warlock is Spiteful Druid. These decks are everywhere at the higher ranks, and you need to be prepared to take them down when climbing. In this game, you are not a combo deck. Yes, you will likely need a few of your Mind Blast s to close things out, but the goal is to simply fight the board and run your opponent out of cards as best you can. In fact, everything about your combo should be on the back burner. To win this game you need to understand Druid's cards and know how to answer them. Shadow Word: Death is fantastic for the middle turns of the game, while your big AOE options are a great way to shut down their later pushes. Never jump the gun early here and always make sure you can handle cards efficiently. For example, you should never waste a Psychic Scream on two minions. Try to find other way to chip minions down and don't worry about taking a hit here and there if it gets your opponent to commit. When playing against Spiteful Druid there are a few cards you need to be aware of. Of course, you always want to have a plan for Spiteful Summoner (turn six or otherwise). Save your big spells and try to get the most use out of Shadowreaper Anduin 's battlecry. It is ok to take a big hit to set up the Death Knight. 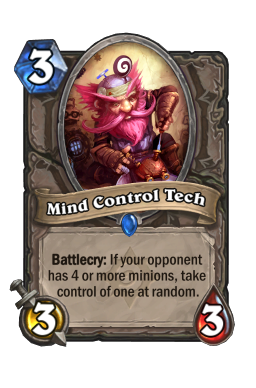 Another card you need to worry about is Mind Control Tech . The 3/3 is stock in Spiteful decks and it can destroy you if you don't think about it. Yes, it often won't come up, but there are going to be scenarios where you can get four minions on the board. 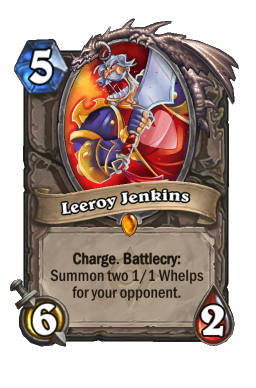 Beyond that, the final card you need to pay attention to is Leeroy Jenkins . While not in every list, it is in enough that you need to keep him on your mind. Never assume your opponent doesn't have burst and always do your best to stay above ten/twelve life when possible. Paladin Beyond Warlock, the other big reason to play this deck is Paladin. As when facing Spiteful Druid, this is a game where you can put your finishing combo on the back burner. All you care about when going up against Uther (Odd or Even) is being able to clear the board. And oh man can you clear the board. Wild Pyromancer , Duskbreaker , Psychic Scream , and Primordial Drake are all incredible in this matchup and you want to lean on them as much as you can. Pyromancer and Duskbreaker are especially strong because they deal with boards that could grow out of control if not answered without costing you too many resources. 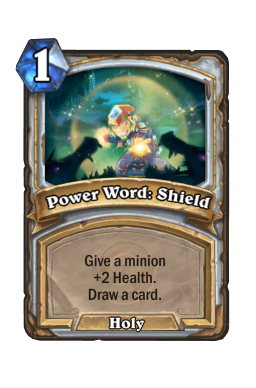 Something as simple as Wild Pyromancer /Power Word: Shield is all you need to keep things like Level Up! 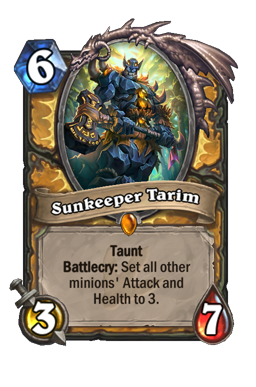 and Sunkeeper Tarim off your back. In addition, remember that your opponents are never going to be able to easily play around Scream. They might buff up minions, but they can't afford to hold too much back. Patience is key against Paladin. Understand how your opponent can put together burst damage and only pull the trigger on your important removal cards when you're either facing down a strong board, your opponent is low on cards, or your opponent has a lot of damage potential. There are many times where, instead of panicking, you simply run out a minion and see how your opponent reacts. 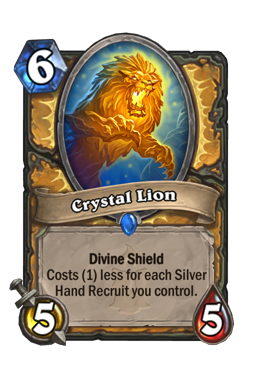 For example, using Twilight Acolyte on a Crystal Lion is almost always going to be a better play than burning a valuable Shadow Word: Death . 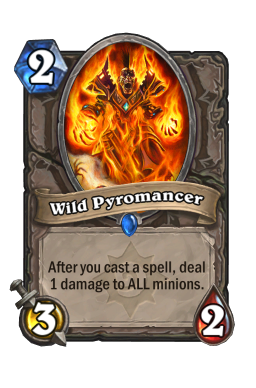 In the same vein, Wild Pyromancer with a couple of spells is almost always going to be better than using a Psychic Scream . That is because you always want to use the cards that have limits to their potential and save the all-inclusive ones for later on. Baku Rogue Coming in at four is Baku Rogue. This is going to be, without a doubt, your most difficult matchup. Not only does your Mind Blast finisher matter very little here, but Rogue has a ton of fast damage that gets around your efficient removal. Yes, you may be able to kill things, but only after they've hit you in the face. For that reason, you want to mulligan away all of your slower cards and look for anything midrange. That will then give you an opportunity to contest the board and make it so that, even if your opponent does have a strong opening, you can answer it and then put on your own pressure. Rogue has become much more tempo oriented in the past weeks, but you still need to be hyper aware of both Cold Blood and Leeroy Jenkins . Keeping each of those cards in mind is important because that will help you understand exactly where your life needs to be to not die. If you ever do get control of the board, Rogue is going to do everything they can to hit your face. 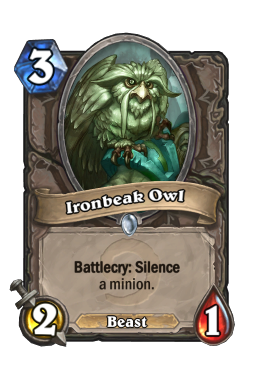 Be ready for that, and always know that Vilespine Slayer and Ironbeak Owl can quickly invalidate your taunts. Though this deck is a control build, you want to mulligan as if it were a midrange list. 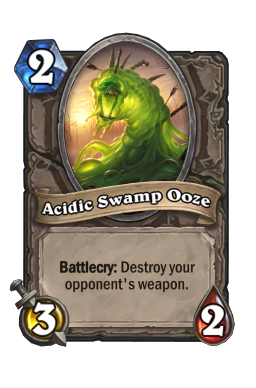 Northshire Cleric , Acidic Swamp Ooze , and Acolyte of Pain[/card] are the three cards you want in every matchup. Shadow Visions should always be kept against control, but it's also good against faster decks with a strong opening. 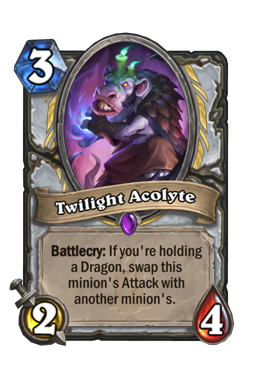 Wild Pyromancer and Duskbreaker should always be kept against aggro, Power Word: Shield should always be kept alongside an early minion, and you want Twilight Drake on curve. 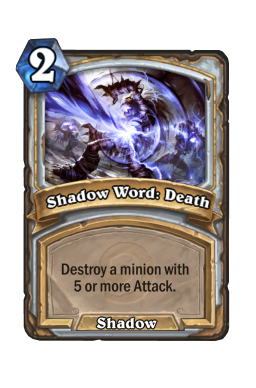 Shadow Word: Death is also strong against Druid if you have a strong opening. Got finishers? I love decks that bring something new to the table, and there is no doubt that this deck does exactly that. You are not a build that is going to go out of your way to play some crazy combo pieces, you are merely a solid control shell that happens to have a burst finisher. That is truly not anything I've seen before, and it makes for a really fun playing experience. If you want something slow but you don't like playing Warlock, this is the build for you. Until next week, may you always quadruple Mind Blast for lethal.